At Sequel Group we give our employees the opportunity to ‘give back’ through taking days to dedicate their time and efforts volunteering. 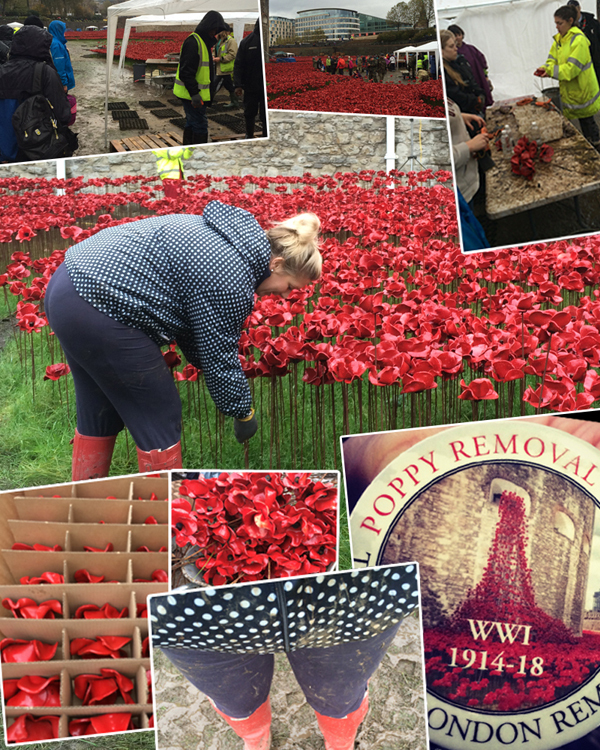 Recently, our Associate Director – Client Services, Caroline Barrett, was involved in an exciting cause – harvesting poppies at the Tower of London from the amazing art installation, created to commemorate the centenary of the First World War. Named ‘Blood Swept Lands and Seas of Red’ the 888,246 ceramic poppies; each representing a life lost in the First World War; of the installation turned the Tower’s moat entirely red. Each one was handmade under the direction of artist Paul Cummins and each was sold to raise money for six service charities, meaning they all had to be removed from the ground, checked, taken apart cleaned and packaged to send… over to you Caroline. “After volunteering I was lucky to get an email in early October asking if I’d like to be part of the poppy removal team. Over 8,000 people were needed to ‘harvest’ the poppies in 2 weeks…bearing in mind it took 4 months to plant them all! So, on the 14th November, I turned up for my harvesting shift, in ‘The Moat’ by which time, due to the lovely UK weather, had turned into a scene more appropriate for Glastonbury. It was pouring with rain; there was ankle deep standing water, and mud….a lot of mud. My shift was from 9am – 12pm and there were nearly 400 volunteers with me, split into smaller groups. We were all initially tasked with making boxes. I was slightly disappointed; I wanted to get my hands on the poppies! BUT, the boxes were key to the process. The tricky part was keeping all the boxes that we had made dry! An hour, and over 1000 boxes later, came the harvesting. Each poppy was made up of the metal stem, the ceramic poppy and a number of washers and bolts holding them together. Once harvested, each poppy had to be disassembled to put the appropriate parts put in the appropriate boxes. Some of the poppies that had been planted first were rusted together, and as they were so fragile it was quite hard work taking them apart. I worked out I harvested and took apart over 300 poppies in the remaining hours of my shift, and I emailed the supervisor a few days later, who said that day, nearly 95,000 poppies had been harvested. Job well done!